Thomas Sigmund (right) celebrates the dedication of NEW Water’s Resource Recovery and Electrical Energy (R2E2) project with staff. Photo courtesy of Tricia Garrison, NEW Water. Sigmund’s commitment to water, the advancement of WRRFs, and the Water Environment Federation (WEF; Alexandria, Va.), earned him the title of 2017 WEF Fellow. The distinction recognizes professional achievements and contributions by members to WEF’s practice areas. Sigmund remembers taking an introduction to sanitary engineering class in college and being inspired by his professor, Bill Boyle. “Boyle made wastewater treatment sound like the most interesting specialty of civil engineering and I was hooked,” he said. Sigmund (left) attends a meeting to kick off NEW Water’s 2017 campaign to support local United Way (Alexandria, Va.) solutions to improve education, financial stability, and health. 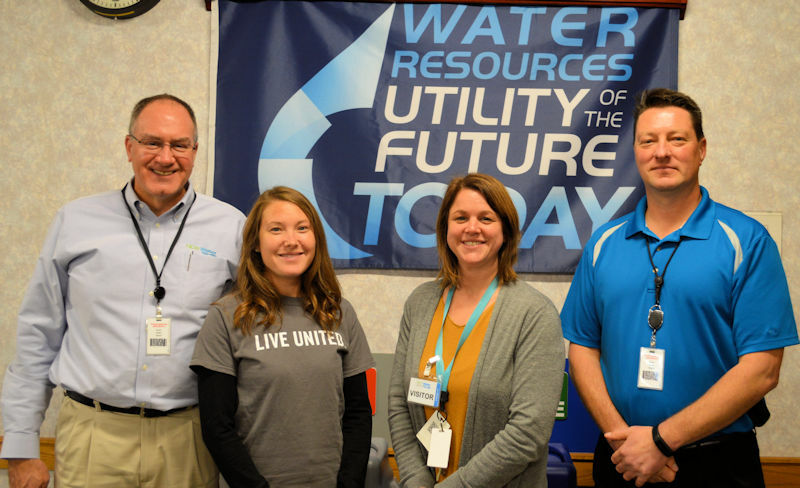 In 2016, the utility was recognized as a Utility of the Future Today for its efforts to recover and reuse resources as well as improve the surrounding watershed. Photo courtesy of Garrison. Equipped with master’s and bachelor’s degrees in civil and environmental engineering, Sigmund started his career as a project engineer at HNTB Corp. (Kansas City, Mo.). He later transitioned first to senior project manager at CH2M Hill (Englewood, Colo.), then to principal engineer at HNTB, and then to vice president at CH2M Hill. He started at NEW Water, the brand name of the Green Bay (Wisc.) Metropolitan Sewerage District, in 2007. He now is a certified professional engineer in Wisconsin, Illinois, and Ohio. As the executive director of NEW Water, Sigmund leads a utility that has 98 employees, operates with an annual budget of $39 million, and serves 230,000 people in 18 municipalities. 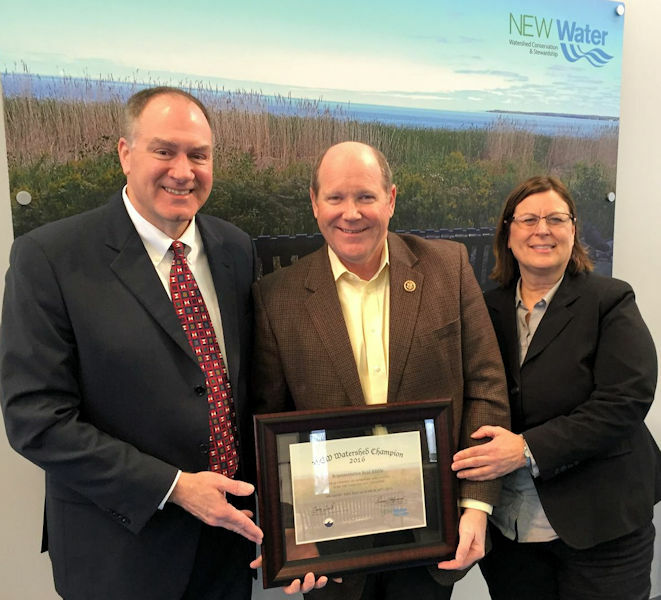 In 2016, NEW Water was recognized by the Utility of the Future Today program for its innovative efforts to recover and reuse resources as well as improve the surrounding watershed. From left, Sigmund presents U.S. Congressman Reid Ribble (R–Wis.) with a NEW Watershed Champion award alongside Green Bay Water Utility General Manager Nancy Quirk during the 2016 World Water Day celebration. Photo courtesy of Garrison. Since joining WEF and the Central States Water Environment Association (CSWEA) in 1981, Sigmund has contributed his skills to both organizations. He is a member of the WEF Awards Committee, serving as chair of its Schroepfer Innovative Facility Design Medal subcommittee. He also is a member of the WEF Utility Management committee, has been a member of WEF’s Technical Practice and Municipal Resource Recovery Design committees, and has contributed to two WEF Manuals of Practice. 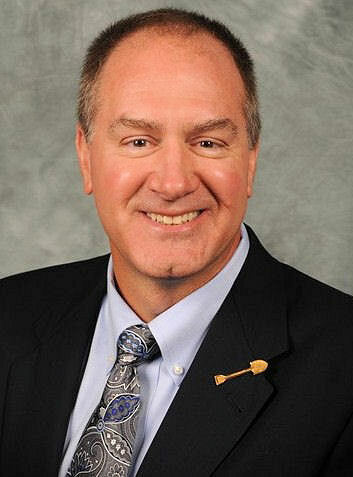 For CSWEA, Sigmund has served as a trustee from 2009 to 2011, chair of the Wisconsin section of the organization, chair of the two events, and member of two committees. Sigmund received recognition as a 2018 Water Environment Federation (WEF; Alexandria, Va.) Fellow for his contributions to WEF and the water sector. Photo courtesy of Sigmund. In 2007, Sigmund received the WEF Schroepfer Innovative Facility Design Medal. The award is presented to a professional engineer who contributes to the design of outstanding facilities that convey, treat, or dispose of wastewater. He received the CSWEA Outstanding Service Award in 2011, Wisconsin Section CSWEA Service Award in 2007, and CSWEA Radebaugh Award for Best Paper in 1986. He also earned membership into the Sentral States Select Society of Sanitary Sludge Shovelers (7S) for distinguished and meritorious service to CSWEA. Volunteering provided Sigmund with leadership experience he needed to advance in his career. And his network has helped Sigmund advance the water sector. 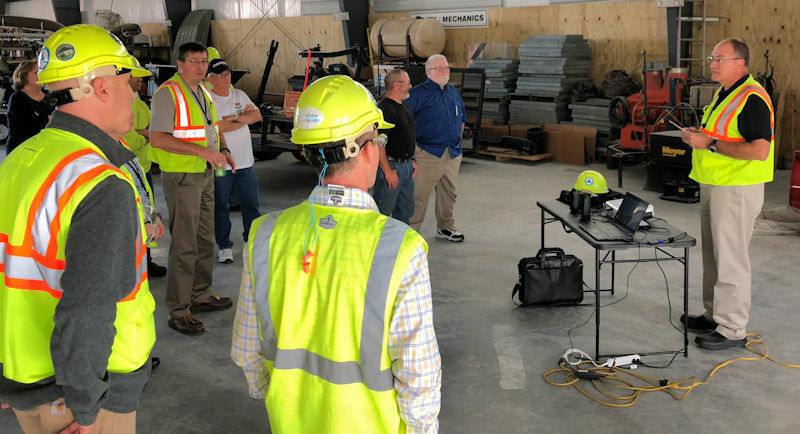 Listening to others’ experiences and recommendations regarding new technologies and innovative practices provided the support he needed to implement these advancements where he worked, Sigmund said. Sigmund also is a National Association of Clean Water Agencies (NACWA; Washington, D.C.) leader. He currently is a member of the NACWA Board of Directors and has volunteered for the organization in numerous capacities. He received NACWA’s President’s Award in 2013. He also has been an active member of many other organizations including the Utility Advisory Group to the U.S. Environmental Protection Agency (EPA), Wisconsin Department of Natural Resources. 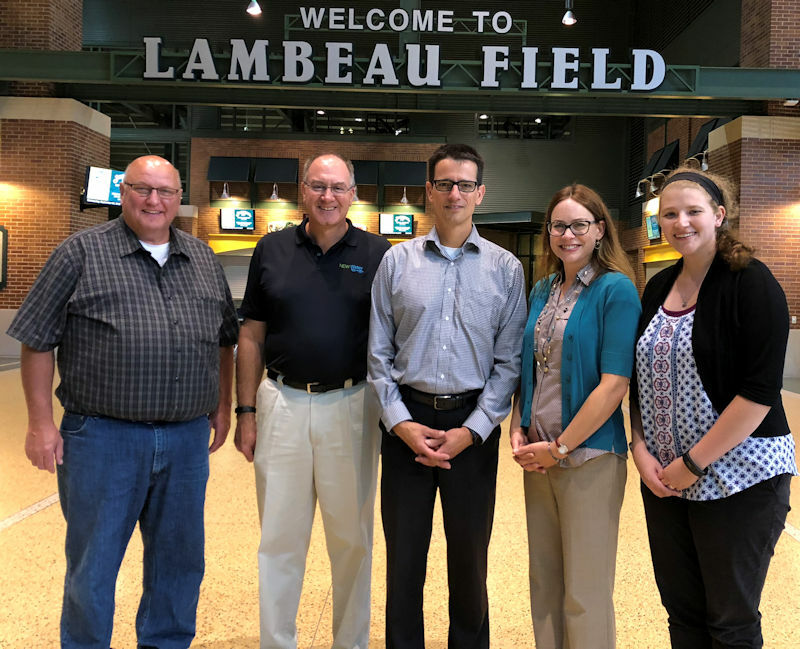 Sigmund (second from left) tours Lambeau Field, where he discussed watershed issues with representatives of the Green Bay Packers football team. Photo courtesy of Garrison. Sigmund’s volunteer work and leadership contributions don’t stop there. He has contributed to numerous publications including those developed by collaborations between NACWA, WEF, The Water Research Foundation (Alexandria, Va.), and EPA. He also has given many presentations at water sector meetings and conferences. And in 2014 he provided testimony to the U.S. Senate Subcommittee on Water and Wildlife about NEW Water’s efforts to incorporate innovative technologies to save water and energy.